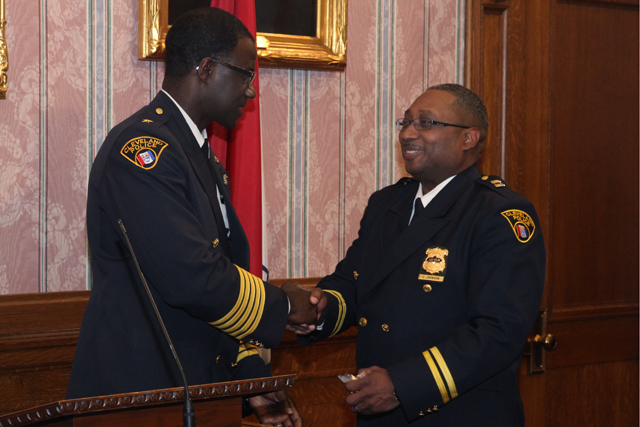 Today, Mayor Frank G. Jackson administered the Oath of Office to Johnny Johnson, who will serve as the Commander for the Bureau of Community Policing for the Cleveland Division of Police. Commander Johnson was appointed to the Division of Police on June 5, 1995 and has most recent served as a Captain of Police since June 29, 2015. As Commander for the Bureau of Community Policing, Commander Johnson will oversee the operations of the Division’s Community Policing Bureau and ensure that the Bureau’s activities align with Consent Decree mandates.